Lady Beaver is an artist, performer and educator in Los Angeles, CA. Her work explores humor and storytelling, as much of her work is narrative and is comprised of the dark comedy of her personal experiences. She is inspired by human behavior and draws brutally honest comics where she is often the main character. Lady Beaver often draws and paints symbols to create a visual language of a given topic in repeating detail. She writes music, stars in her own music videos, and performs improvisational comedy twice a month at The Clubhouse in Hollywood. Lady Beaver is a resident artist at The Hive Gallery in downtown Los Angeles. 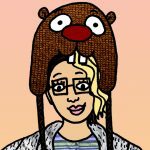 Join Lady Beaver’s Mailing List!